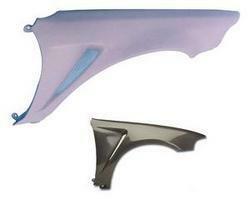 Are you tired of the old look of Z3 and SLR fenders? Get something new and different. Our F1 fenders not only provide an awesome and unique new style but it also creates better cooling and air circulation in your engine compartment. You will get much cooler overall engine temperature by installing the F1 fenders and less weight on your body. F1 fenders are extremely light and weight only about 4lbs per fender.